Occupational licensing is the scheme by which entrepreneurs seeking to start business in as anything from hairbraiders to taxi drivers to florists have to undergo an expensive and time-consuming "certification" process before they can legally open a business . This ends up restricting entry into these licensed occupations. As with all government-created barriers to entry, occupational licensees hurts consumers by increasing prices and limiting choices. These laws also function as a barrier to economic mobility. Many low-income Americans who have the skills to successfully operate a businesses are unable to do so because they cannot afford the cost of obtaining a license. In the same way that I believe that innovators shouldn’t have to ask the government for the permission to bring new products to consumers, I believe people who want to work, start businesses and make a living shouldn’t have to ask the government for the permission to do so. But you don’t have to be a committed libertarian to understand the need to a return to more permissionless employment. First, these schemes are pervasive and costly. Occupational licensing has grown significantly since the 1950s, when roughly one out of every 20 workers were required to obtain a government license. Back then, licensing requirements were typically justified on the grounds of consumer protection and public safety (PDF). Many of the first license requirements targeted high-risk, and often high-income, professions such as surgeons and doctors. Even this justification is suspect, but at least these early schemes were relatively less regressive. Today, the poor overwhelmingly bear the brunt of these burdens. Economists Morris Kleiner and Alan Krueger estimate that one out of every three U.S. workers are currently saddled by ridiculous occupational-licensing requirements. Many of these occupations — like working as a hairdresser, funeral attendant, florist or transit driver— traditionally provided low-income Americans with a ladder to self-sufficiency and upward mobility. By making it more expensive to reach the first rung, we make their climb out of poverty that much more difficult. If you want to wrap your head around how pervasive this issue is take a look at the great study on this issue, License to Work, published a few years ago by the Institute for Justice (IJ). 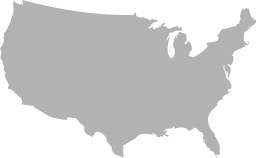 To my knowledge it is the first and only holistic look at the burdens and breadth of licensing laws targeting 102 low- to moderate-income occupations in all 50 states and the District of Columbia. The report shows that in every state you need a special authorization to be a cosmetologist, a barber, or a manicurist. It also shows that in some states you need a license to braid hair, massage horses or be a florist. There is also no rhyme or reasons for which occupations require a license, how long it takes to get one and how much it costs. For instance, cosmetologists require more days in education and higher fees per license on average than emergency med‐technicians. The IJ report also notes, “EMTs hold lives in their hands, yet 66 other occupations have greater average licensure burdens than EMTs,” including interior designers and barbers. 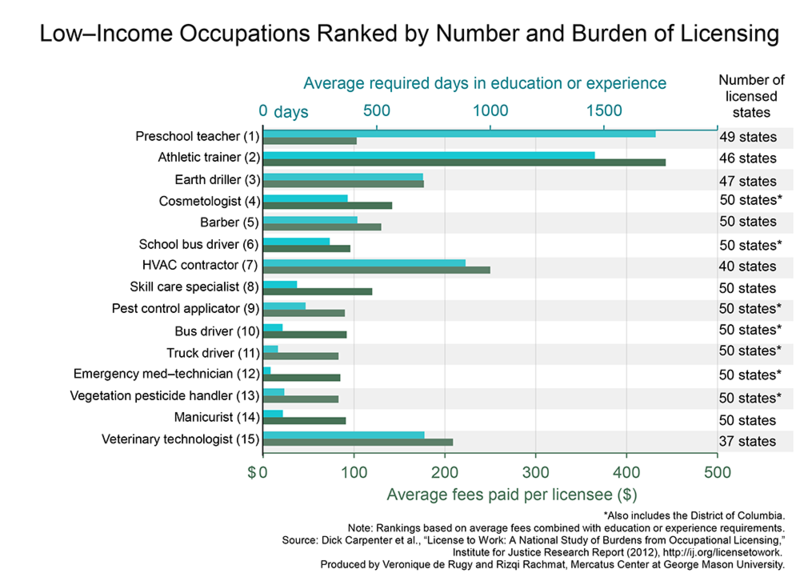 The opportunity cost of occupational licensing is also high. According to the Wall Street Journal “occupational licensing is estimated to add at least $116 billion a year to the cost of services, or about 1% of total U.S. consumer spending.” So basically, it means higher prices for consumers. IJ reports that on average these licenses require $209 in fees, an exam and 9 months of training. It’s arbitrary, too. All workers are not equal before the licensing boards, and some states are worse than others. Arizona is the worst offender, requiring licenses for more than 60 low-income occupations. It also charges an average of $450 in fees for the privilege. Iowa, the least burdensome of the 20 states listed, still requires licenses 54 low-income occupations. President Obama's interest in occupational licensing may seem admirable, but perhaps his time would be better spent working to eliminate those federal policies that are reducing economic opportunities, such as Obamacare. But instead of reducing federal burdens on job creation, Obama's budget increases them, by, among other things, spending $500 million on a new licensing scheme. Spreading the Development and Adoption of Industry-Validated Credentials. The Budget provides $500 million for Industry Credentialing and Career Pathways Grants, including $300 million specifically targeted at information technology jobs. These grants would be competitively awarded to create employer-validated credentials where they do not yet exist, drive additional employer uptake of credentials that do exist, and develop curricula and assessments that lead to the credential. Grants would be awarded to employer collaboratives in partnership with the workforce system, post-secondary institutions such as community colleges, and other innovative education and training providers. So $15 million would go to eliminating unnecessary occupational licenses, but $500 million would go to creating new credential processes where credentials do not currently yet exist. And then grants would go to instructional facilities to teach students the training necessary to receive these new credentials. Employer-supported credentials are not inherently bad things, particularly in the complicated world of information technology, but all sorts of certifications exist in that field, have for a long time, and are constantly being updated as innovations in technology require. It’s very easy to imagine the incentives here to manipulate this program to favor grants for certain types of training over others wanted by competing tech firms or the inability of the government or college to accurately predict what credentials are really needed down the line. Furthermore, obviously with $500 million being tossed out, positive outcomes will be demanded. Will this lead, in fact, to the creation of new occupational licensing programs to make sure people who want to work in these fields get the necessary credentials promoted by the government?